They say that plagiarism is the best form of flattery; However in our industry, it not only hurts knife makers, but it can hurt the customer as well. A knife that is being used for utility or self defense must be of the highest quality to remain dependable. When you have a knife that is being copied and passed off as an original for a ridiculously low price, you do not know what material was actually used to make the product - no matter what is written on the blade. It is likely that the cheapest possible material was used in an effort to make the most product from a counterfeit item. This means that counterfeit items are likely to crack, chip, snap, break, not hold an edge, or otherwise fail on you. Your safety and well being is our number one concern, and poor quality knives can fail at the worst possible times, such as a life or death self defense situation. The risk you run with poor quality items is not worth death or injury to "save a few bucks" - Don't trust your life to a $20 dollar knife. Counterfeit items are not limited to mass scale production items such as Fox or Emerson, but well known knife makers are also frequently copied as well. Purchasing a counterfeit of these items takes food out of the maker's mouths who are usually just trying to feed their families. We will not service, recommend, or otherwise support counterfeit or substandard products. Drastically lower prices compared to well known retail sites - "Too good to be true". Imitation designs made of Damascus, but the maker never actually produced such a version. 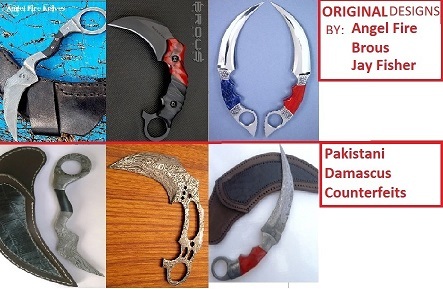 A rather large number of knives on Ebay, Alibaba, Amazon, and DHGate are counterfeit. Please make sure that you buy your knives from reputable makers and websites, even if they are our competitors. Remember - "Don't trust your life to a $20 dollar knife."